One often hears about a show which leaves the audience speechless, but seldom is it said to so affect the actors. 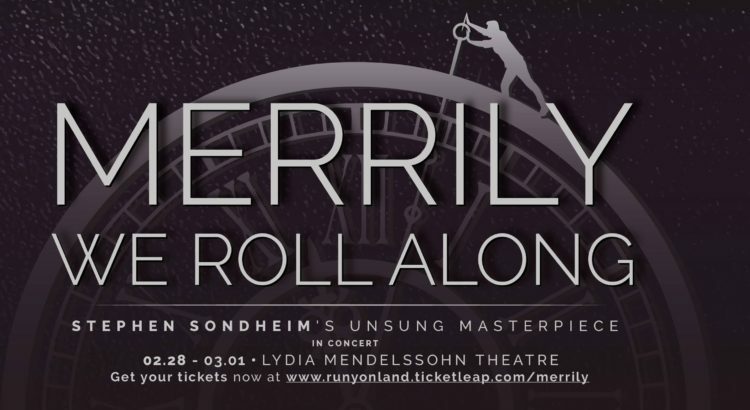 The big story surrounding Runyonland’s production of Merrily We Roll Along last night was, naturally, that, due to illness, Wilson Plonk, the actor playing Charley Kringas, could not speak. In lieu of an understudy, the actor steadfastly went on and made his motions as producer Thomas Laub supplied a voice for him from the pit — fortuitously unoccupied as the band took its residence at the back of the stage. Merrily We Roll Along, a musical by George Furth and Stephen Sondheim is an irony-laden instance of the old trope, “genius unrecognized in its own time.” A script in some ways about that very subject, it flopped in its original Broadway production, closing after barely two weeks of performances. (For the scoreboard, Runyonland’s production runs only two days, but who’s keeping track?) It subsequently went through some rounds of revisions, and the version presented by Runyonland Productions derives from the 1994 Off-Broadway revival. Merrily We Roll Along is by no means an easy show to pull off, and I laud Runyonland Productions for taking a crack at it. It is an enthralling story, almost Faustian in nature, about the unsuspecting encroachment of life, and worth anyone’s time to see. One performance remains, March 1st, at the Lydia Mendelssohn Theater.